Whipping up homemade biscuits with all purpose flour is a breeze. In my house, we almost always have flour in the pantry. Really, flour is an ingredient in so many recipes that its difficult not to take it for granted. Our drop biscuit recipe is one of our best, and is amazing served up with our favorite Sausage Gravy recipe. Served alongside our Southwestern Breakfast Skillet, you’ve got the perfect breakfast pairing! There’s a reason I love recipes like our drop biscuit recipe. 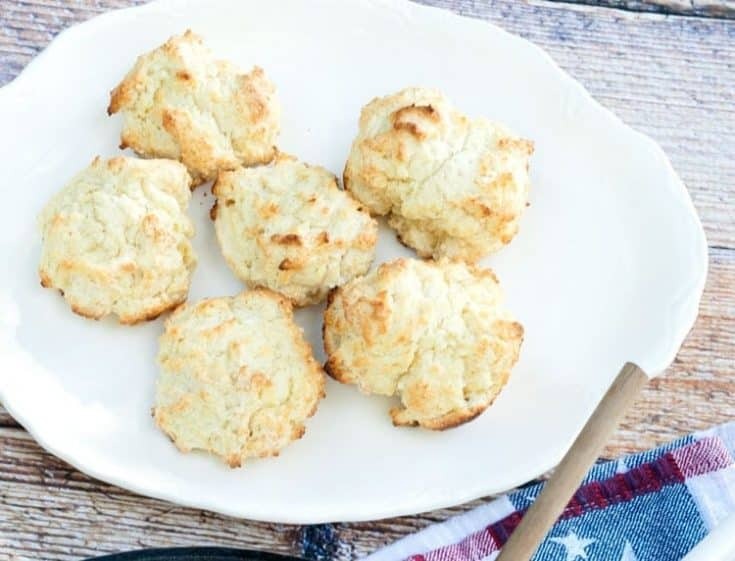 Made from a few simple ingredients that are sure to be staples in your pantry, this down home biscuit recipe is easy to throw together in a pinch. Since drop biscuits don’t require rolling out dough, biscuits can be ready in no time–which is perfect when you’re trying to get breakfast or dinner on the table in a hurry. Use vacuum seal containers to keep things like flour fresh in the pantry. We’re pretty sure you’re going to fall in love with these biscuits as much as we did back at the lakefront cabin in the Northwoods of Wisconsin. Besides all the fresh air we enjoyed up there, I had fun cooking some really good food and trying out some new recipes. Something about food just seems different when you’re staying in a cabin. Sure, there’s the fresh country air that I mentioned. There’s also the sound of nature all around: the bird calls, the cricket chirp, and even the frogs croaking in the shallow waters of the lake shore. With all of that comes a back to the basics feeling that we just don’t get that often in today’s rush of instant gratifications. You know what I’m talking about, and it all comes back to technology. Our visit to the Northwoods cabin was one of the best vacations that I’ve had, and I can attribute that largely to the fact that we were almost completely shut off from our phones. And by phones, I don’t really mean the calling aspect of our phones at all. Instead of browsing around on the internet, we lived. I cooked. Watched some television–not Netflix. Played some games. We fished and sat out by the fire, enjoyed throwing sticks for our dog to fetch in the lake.